Beautiful glass hummingbird feeder holds nectar for replenishing energy. Green Glass. 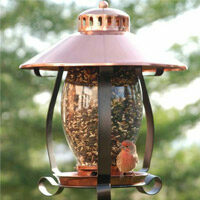 Fill bird feeder using a supply of Nectar, and refill as needed.